Rice, Anne. “Prince Lestat: The Vampire Chronicles”, Knopf , 2014. It has been over ten years since Anne Rice has written a new book of “The Vampire Chronicles” but those days are over now. Both Rice and Lestat, her quixotic bloodsucker are back and it is so good to be able to say, “Welcome home”. Using characters from her earlier novels and new ones, we get a look at what is going on with the undead. But we also get something more—questions of how far is science allowed to go, beliefs that are contradictory and the need to belong. I did not realize how much I missed Anne Rice until I read this book. This novel picks up where “The Vampire Lestat” ended some twenty-five years ago and we enter a new world of spirits and forces as we meet the characters, the legends and the stories of the “Vampire Chronicles”. When the book opens, the vampire world is in a state of crisis. Vampires have gotten out of control and there are burnings everywhere in the world as well tremendous massacres. There is a voice that orders that vampire-mavericks in various cities be burned. The same voice calls to older vampires who are sleeping to aid in this. And, at the book’s center, the seemingly absent, curiously missing hero-wanderer, the dazzling, dangerous rebel-outlaw–the great hope of the Undead, the dazzling Prince Lestat… Lestat writes how much he knows that we have missed him and that we needed him back. It begins with a “Blood Genesis” in which we revisit Maharet’s tale of Akasha, the spirit Atmel, the origin of the vampire, and how in the events of “Queen of the Damned,” Mekare killed Akasha and took into herself the “Sacred Core”–or life force–of the race of vampires. Moving forward we get a look back at the characters we have met before. 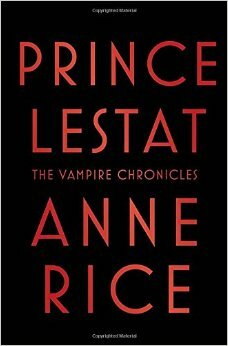 “Prince Lestat” takes us is into a world that readers had almost forgotten because we had heard that it would be no more. We are in a vampire world in chaos as vampires all over the world cry for Lestat, but he does not seem to be. However as the loudness of the cries increase, movement begins. Benji airs a specific message to young vampires globally, and he talks of a “parentless tribe” in the midst of anarchy and a burning. Then there is another voice that whispers to the young and old alike and it orders the destruction and dominion to take place as the young and the useless vampires are done away with. The voice tells them to destroy, to claim dominion, and weed out the young, the numerous, the riffraff of vampire kind. Everything that happens now is reported back to us via third person voices until Lestat speaks in the first person. Many ancients such as Teshkamen, Seth, Nebamun, and others, come forth to assist their brothers and to “re-parent” the tribe., as it were. Younger vampires, such as Fareed push their ideals into what is going on and we see that the intention here is erase the old perspective that vampires are evil. There is a new message that evil can be found in anything, as can good, but only through better understanding of oneself, and one’s kind, can love be found; but only when evil and good are acknowledged. As the story moves forward, we realize that the voice is Amel who is fighting to be released from Mekare so that hr can find a vampire who is equal to him but is also more driven. The book also gives us details about the most intrepid Order of psychic investigators, the Talamasca. Rice looks at vampirism differently here and we understand it differently. This entry was posted in GLBT fiction on November 1, 2014 by Amos.